The vendor landscape of the global intumescent coatings market is moderately concentrated, with the leading three companies accounting for nearly 45% of the overall market in 2015, observes Transparency Market Research in a recent report. Leading vendors in the market are focusing on expanding their geographical outreach and distribution networks to gain a greater share in the market. Focus has also increased on exploring new growth opportunities through mergers and strategic collaborations. Moreover, investments on R&D activities have also increased substantially in the past few years with the view of expanding their product portfolios and introducing innovative products. Some of the leading companies operating in the global intumescent coatings market Akzo Nobel N.V., PPG Industries Inc., Flame Control Coatings LLC, Albi Manufacturing, Sherwin-Williams Co., RPM International Inc., OMNOVA Solutions Inc., and 3M. According to the report, the global intumescent coatings will rise to a valuation of US$675.6 mn by 2024, exhibiting an impressive 7.0% CAGR from 2016 and 2024. Of the key applications of intumescent coatings, the ones across the building and construction sector have remained the most lucrative over the years. Owing to the continued rise in demand for intumescent coatings across the building and construction industry, the segment is expected to remain highly lucrative over the report’s forecast period. From a geographical standpoint, the market is presently dominated by Asia Pacific, thanks to the massive rise in construction activities in the infrastructure as well as residential and commercial sectors. 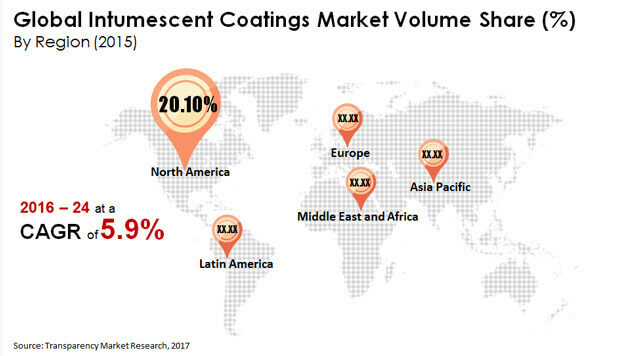 The demand for intumescent coatings is expected to remain strong in the region over the forecast period as well, with China emerging as the leading consumer. Besides this, demand from Japan and India is also expected to remain strong over the report’s forecast period. The steady expansion of the building and construction sectors over the past few years has been ones of the key factors driving the global market for intumescent coatings. The massive rise in population, especially across mushrooming urban settings in emerging economies, has led to a massive rise in the need for new residential construction projects and effective infrastructure. Intumescent coatings provide good safety to a building structure from potential hazards such as excessive heat and fire, while also fostering strength and longevity of structural steel. Owing to these factors, their usage has massively increased in recent times as government norms pertaining to the structural safety of building constructions have become stricter across the globe. However, the market faces a major roadblock in the form of key raw materials required for the production of intumescent coatings. This factor is expected to negatively impact the market to a certain extent over the forecast period. Nevertheless, an increased set of applications across industries such as petrochemical, chemical, and steel will help revive growth opportunities.